The Chambord Castle built in 16th century France is seen here in this castle tapestry. This chateau was constructed for King Francois I and is well known for its unique architecture in French Renaissance style. The castle is in the Loire valley and is the largest castle in this region. It is thought that the architect of this chateau is probably Philibert Delorme though Leonardo Da Vinci is thought to be the originator of the original sketches. Here we see the northern aspect of the chateau with its grounds and moat which is used to defend the castle in traditional castle design. 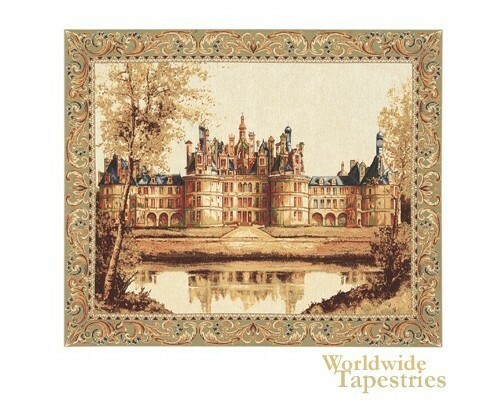 This castle tapestry "Chambord Castle I" is backed with a lining and has a tunnel for easy hanging. Dimensions: W 19" x H 14"
Dimensions: W 21" x H 17"
Dimensions: W 44" x H 36"